Discussion in 'Google TV News' started by JimMariner, Oct 27, 2010. Since word broke late last week that ABC, CBS and NBC are blocking access by Google TV (GOOG) to their full-length programs, I've been scouring the web and speaking to colleagues, attempting to get some insights about what's going on here. Though I've heard plenty of free-floating concerns raised, I've yet to really understand solid reasons for why broadcast networks are doing this that can't be addressed somehow. Therefore, as best I can tell, for now at least, I think the broadcast TV networks are wrong to block access. The most obvious reason is that they're creating a false and meaningless distinction between screens. Whereas you can "go online" and freely access plenty of ABC, CBS and NBC shows at their own web sites, (and at Hulu for ABC and NBC), the networks have decided that if you're trying to "go online" via your Google TV, that's unacceptable. In an age where computer screens are getting bigger all the time - looking more like TVs - why exactly should this distinction matter? Some, like Mark Cuban, have argued that because the networks are now receiving retransmission consent payments from some cable/satellite/telco distributors, they should withhold their programs from Google TV unless Google pays too. But this doesn't make sense either. Even though there have been retransmission consent agreements in place for a while now, I'm unaware of a single instance where these have prompted any network to take down a program that's freely available online. Maybe that's a world we're heading to, but it certainly isn't here now. If the argument is that cable/satellite/telcos are worried that Google TV will incent cord-cutting, that's unfounded too. 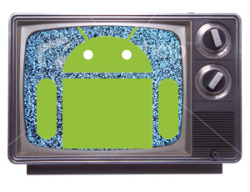 It's silly to believe that people who love their cable shows are all of a sudden going to forego them simply because the same broadcast shows that were always available to them are now also available via Google TV. Meanwhile, even trying to define Google TV as a "distributor," is problematic. Is Google TV any more a "distributor" on TV than Google the search engine is a distributor online? Google the search engine creates value by helping users find what they're looking for while helping content and commerce companies by bringing users to their front doors. In fact, if you do a Google search today, for say "latest episode of CSI:Miami," the top result is for the show's page on CBS.com, where today you can watch last night's episode. Does CBS get paid by Google as a "distributor" to bring users to its site? Of course not; instead it just implicitly says "thank you." And by the way, comparing Google TV to Netflix (NFLX) also doesn't make sense. Netflix IS explicitly a distributor, which is paying for content that is NOT freely available anywhere online. Executed correctly, Google TV should play the same role as Google does online, bringing viewers to networks' shows when they want. It's like video-on-demand finally done right. In reality, this is what the networks and Hulu have been doing on their own sites already; making on-demand access available. They've done this wisely, by creating a delayed window that is typically 6-8 hours after first-run on-air. At a time when "must-see TV" is a vestige of another age, making effortless on-demand access is critical to networks' future relevance. Just last week research from Say Media suggested that up to one-third of adult viewers (no surprise skewing younger) have reduced or eliminated their live TV viewing, tangibly showing how high the stakes are for on-demand viewing options. If all of that weren't enough, the simple fact is that online distribution of TV programs is both a firewall against DVR-based viewing where ad-skipping is rampant and a big opportunity for fresh profits. With online there's no skipping the ads and they're better targeted and more interactive to boot. As I wrote earlier this year, ABC has already achieved "DVR economics" with ABC.com shows and since all the networks have increased their ad loads this year, online distribution is no doubt becoming a nice profit center for all the networks. In fact, AdAge just reported on the success that CW is having with increased ad loads. So what's going on here? It's not retransmission consent. And the programs are still freely available online. And cord-cutting is unlikely to result. And Google's playing the same role (if not better) with Google TV as it does in online search. And more online streaming is clearly good for networks. Is it just a deep-seated anxiety that networks have about Google being the big bad wolf that really wants to blow their houses down, commoditizing them over time? Maybe it is, but since it's practically inevitable that the networks will also block the boxee box when early users being installing it soon, that alone can't be it either. The only thing that is for sure here is that as connected devices proliferate, sustaining these artificial boundaries will only frustrate viewers and make the networks look increasingly foolish and irrelevant.